Adrienne Bailon is of course, one of the co-hosts on the popular daytime talk show The Real. We love her fashion style and her witty take on things, so it’s little surprise we also LOVED the flowers she chose for her beautiful bridal shower. Read on! Adrienne and fiancé Israel Houghton were friends for years before they become romantically involved. In fact, Adrienne admits she used to set him up with her friends. When things evolved they wanted to be sure that no matter what happened, they would remain friends, but obviously true love blossomed! The pair became engaged in Paris and plan to wed by end of the year. The shower was held at the trendy Fig & Olive restaurant. Both Adrienne and Israel love DIY so they contributed many elements to the shower decorations, such as spray painting the Eiffel tower models rose gold, to match Adrienne’s engagement ring. The pair plan to add DIY elements to their wedding too (can’t wait to see that!). They even set the tables themselves and included framed photos for a personal touch. We loved the flowers they chose! This soft and romantic mix of traditional pink, cream and white blooms such as roses, hydrangeas, and ranunculus is the perfect accent for a dreamy “old world” theme like this one. 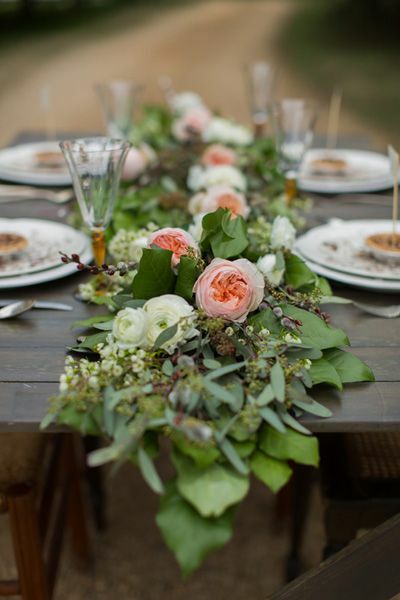 If you also adored Adrienne’s romantic Parisian theme, try Subtle Beauty Centerpieces from BunchesDirect. This gives you the look at an amazing price! For your bouquets, we suggest Pastel Sparkle, Pink Triumph, Heavenly Morning, Summer Love or World’s Blessing. We look forward to seeing the flowers that Adrienne and Israel choose for their soon-to-happen wedding day. Stay tuned! Coming up with your centerpieces is always one of the most important, and sometimes the most difficult, decisions when planning your event. Most of us think of traditional vases for our centerpieces, in various shapes and materials. Don’t be afraid to get creative with your containers! They can be the best way to incorporate a theme and set up some unique table settings that will have your guests talking for months to come. And what is one of the best sources for inspiration when it comes to creative containers? Your own kitchen! A rummage through your shelves can yield some wonderful ideas for how to create some truly special centerpieces. Once you choose your container, you can find the numbers you will need from online suppliers, through kitchen supply stores, or local shops including your dollar store. 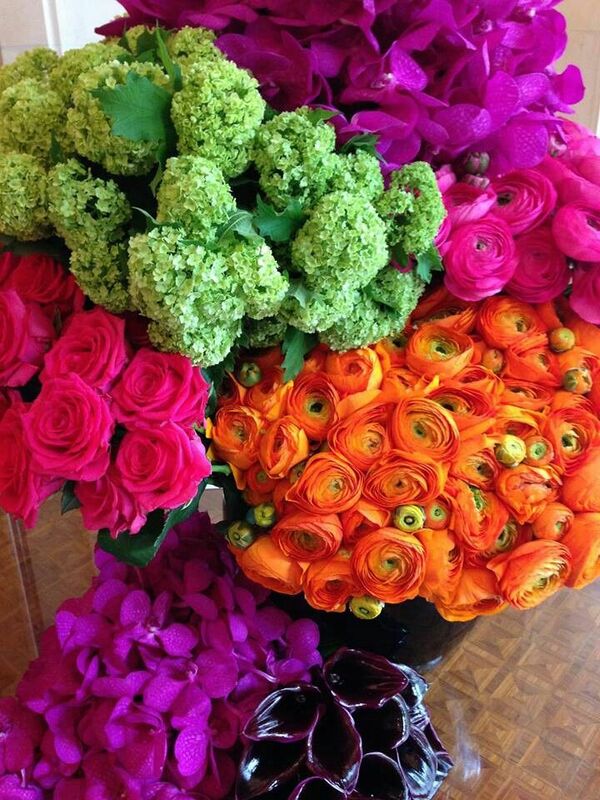 Buy fresh bulk flowers to complete your look. Make things even easier by choosing a beautiful ready-made centerpiece from BunchesDirect. Our centerpieces come assembled and ready to be trimmed to whatever height you need for your own container. Pretty teapots and stacked plates make for very lovely, and unique, centerpieces! Check out local garage sales, vintage shops or second hand stores for a wonderful budget-friendly selection. This idea would be especially suitable to a bridal shower, a lunch, a tea, or any afternoon event. These pink roses are a lovely complement to the old fashioned charm! Cake stands are a perfect way to create a very unique and elegant centerpiece, and an easy way to provide height and interest to any table! They also make for a very easy DIY project. 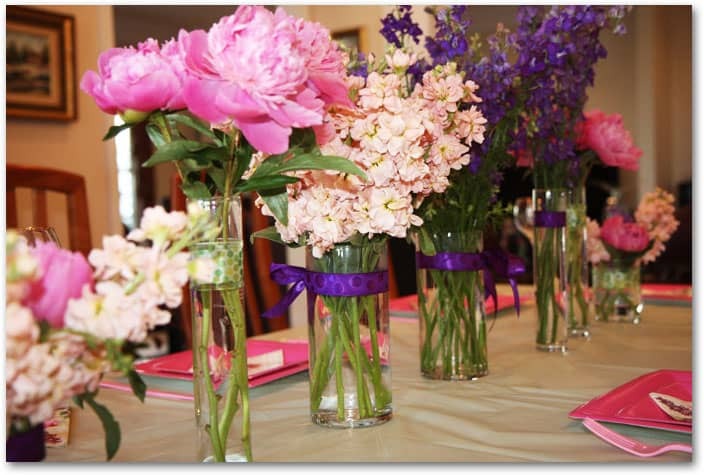 Your selection of blooms is endless, and what you choose can suit the formality and the type of event. Choose traditional flowers like roses, peonies or ranunculus for a more traditional affair or vintage theme. Choose bolder blooms like gerbera daisies or bright carnations for a less formal event. Wine glasses are a go-to way to create beautiful centerpieces on a budget! 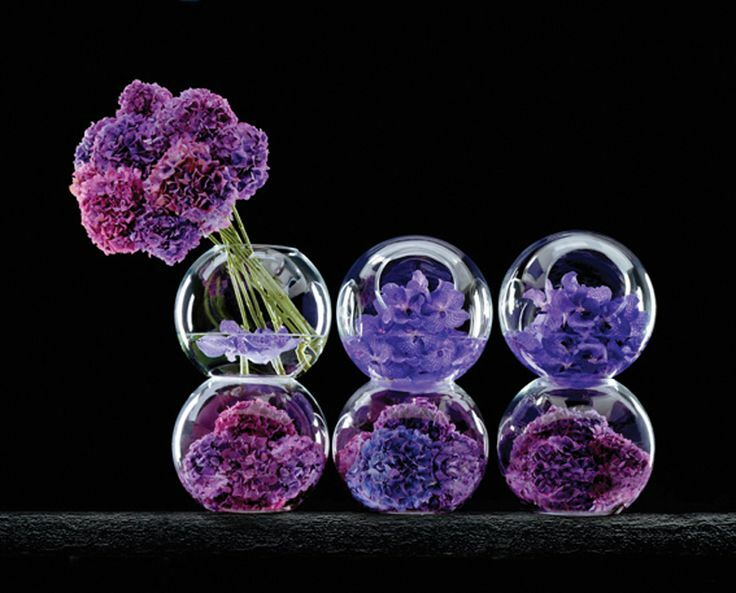 Use them upside down with blooms under the glass, or right side up as lovely footed vases for your favourite blooms. These fresh tulips are the perfect complement! Try martini or margarita glasses for other fun ideas. Stemless wine glasses will also work—just put the head of one bloom in each glass for a very pretty effect. Galvanized buckets make for great centerpiece containers too. Use this look to create a more informal feel. This would be perfect at a country or beach wedding. Choose flowers like these hydrangeas, snapdragons, roses and alstroemeria for a perfect look! Grab your favorite mixing bowl and set up a beautiful centerpiece! Don’t be afraid to mix styles and patterns on your various tables. (This is another great excuse to tour your local garage sales or vintage shops!) These beautiful fresh peonies are the perfect addition to this vintage bowl. Tip: use masking tape to create a grid pattern across the top of the bowl. This will keep your blooms arranged with ease and precision. If you have the kitchen containers ready to go, but you aren’t sure what to put in them, go with ready-made centerpieces that you can trim to your needs. We’ve collected a few to show you here, but be sure and see all centerpieces at BunchesDirect. Have fun rummaging in your own kitchen—you never know where inspiration can strike! You don’t have to stick to the same tried and true ways to decorate your wedding or event! Buy bulk flowers or bouquets of choice, and get creative. We’ve gathered some wonderful ways for you to make DIY creations that are sure to make your decorating stand out! Buy bulk flowers and make a DIY wedding aisle garden, This is so easy, and so cute! Wrap stems to wire stakes using green floral tape and accent your wedding aisle or any area of your event venue. 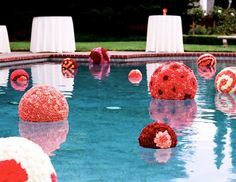 Don’t overlook a swimming pool, pond or other water feature at your event venue as a great location to add some major “wow” factor. It’s easy to make your own pomanders, or kissing balls, using bulk flowers (click to read how). Choose hardy flowers such as carnations, gerberas, or chrysanthemum daisies for great results. Use floral pins to hold them (glue might dissolve in the water) to styrofoam balls from a craft store. Instead of one centerpiece in the middle, decorate your tables, either indoor or outdoor, with ease using DIY garlands with bulk flowers. Keep the garlands unstructured to make things easy. There is no “right” or “wrong” look for this—just go with whatever you love! Choose some greens, such as seeded eucalyptus. and your favorite flowers, such as roses, ranuculus, sprigs of baby’s breath, or peonies, and get creative. Use green floral wire to hold your masterpiece together. This is a lovely idea for a wedding! 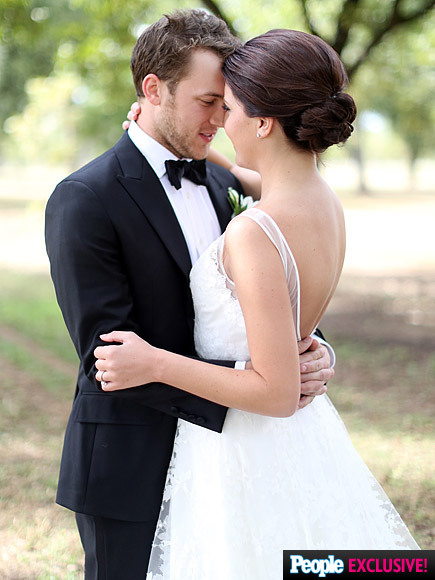 Choose either the first initials of the bride and groom, or the initial of your new last name. You can either buy a letter form at a craft store, or stencil on and cut out your own from sturdy, thick card stock or corrugated plastic from your home supply store. Buy fresh bulk flowers and floral adhesive glue to attach the flower heads to the letter shapes for a truly buzz-worthy addition to your wedding style. Try carnations, or football chyrsanthemums for a budget-friendly and sturdy option. Here is another great use for some DIY pomanders! 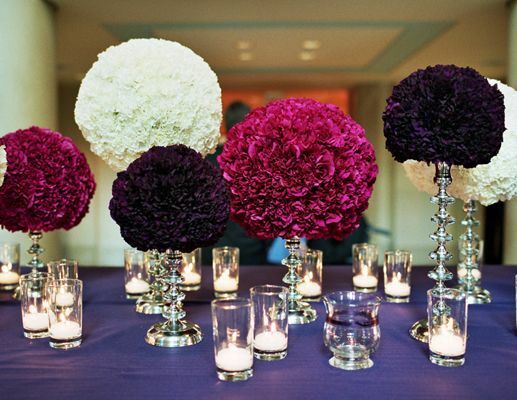 Choose your bulk flowers to coordinate with your event colors, such as these dramatic hot pink carnations. See idea number two for the instructional link and make the pomanders. Set them on assorted candlesticks for a truly unique look. Even a single flower creates a lot of impact and visual style when used to embellish place settings. Order your bulk flower of choice, like these elegant pink roses, and the rest is easy! You could also tuck the roses (with stems) into folded napkins or lay them across the menu cards. For even more savings buy roses by the box (available at BunchesDirect). 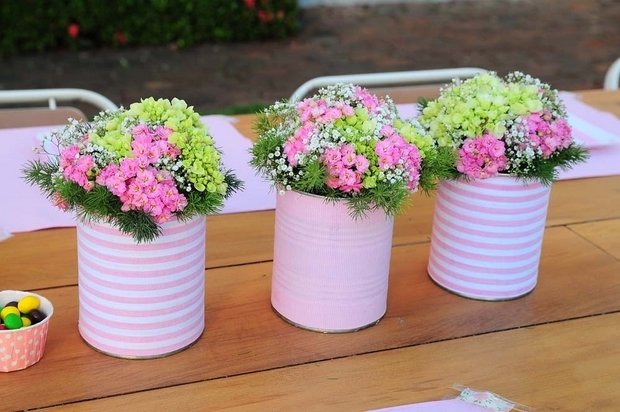 Who knew tin cans could make such fabulous flower containers? Clean cans well and make sure there are no rough edges. Wrap cans with fabric, craft or gift paper, wallpaper pieces, or fancy napkins and secure with a lacquer from the craft store. Buy small pre-made bouquets or bulk flowers and arrange in the cans using some floral foam to keep things hydrated. Sweet bouquet choices: Pure Expression or Spotlight. Get creative! 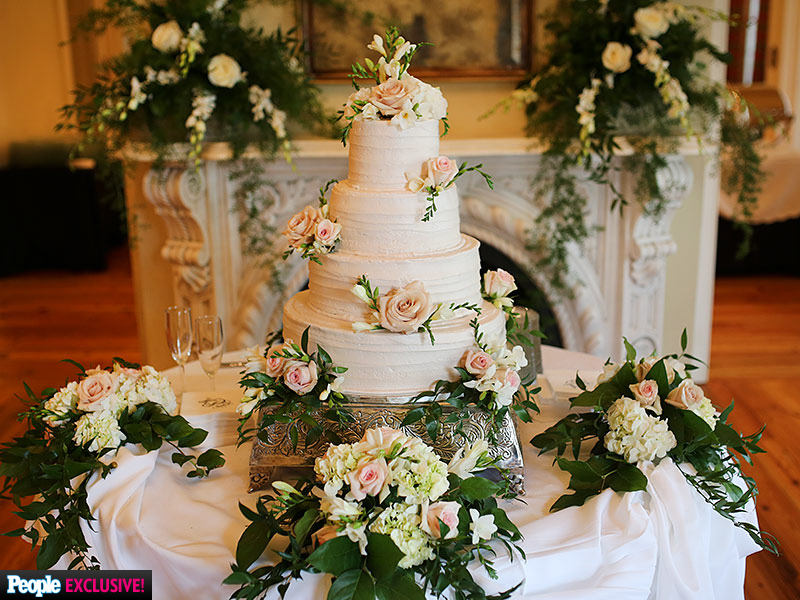 Use a cake stand like this one (you can check discount stores), some floral adhesive glue and your chosen bulk flowers to make some very “out of the box” centerpieces for your wedding or event, or to accent a buffet or display table. Floral adhesive glue is perfect as it provides a waterproof bond to foam, ceramics, glass and plastic and does not brown the flowers.Buy bulk flowers from a reputable vendor so that they are sturdy and fresh. Flowers such as chrysanthemums, carnations, and hydrangeas are good for these because they provide a compact blossom backdrop. 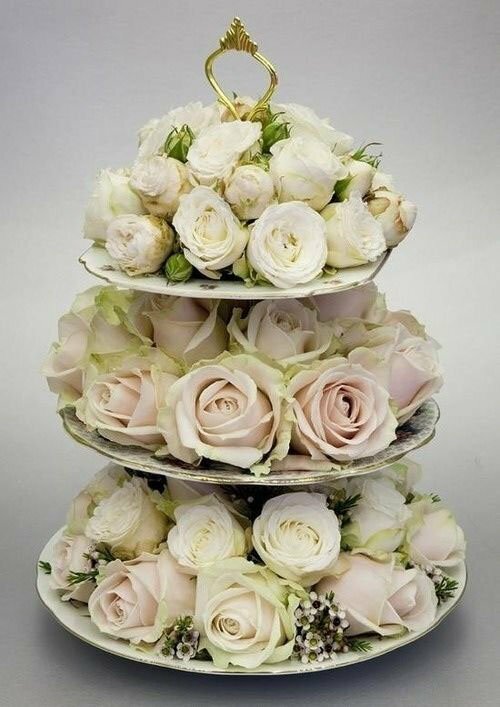 You can then add more delicate flowers on top, such as pretty spray roses. Very unique! Looking to the greats can provide inspiration for your own beautiful wedding and event flowers. Their ideas can fuel your imagination and show you what is possible. One of the true greats when it comes to flower designs and installations is definitely Jeff Leatham. Jeff is currently the Artistic Director at the swanky Four Seasons Hotel George V in Paris, and prior to that oversaw the flowers at the Four Seasons Beverly Hills. He did the wedding flowers for such celebrity clients as Chelsea Clinton, Eva Longoria, Avril Lavigne, and Tina Turner, as well as doing events for clients such as Oprah Winfrey, the Kardashians, Madonna, Kylie Minogue, Celine Dion, Bulgari, Givenchy, Swarovski Crystal, Samsung and Dom Perignon, to name but a small few. He has written two books about his floral artistry and been featured in a documentary, as well as being awarded a Knighthood in France for his contributions to arts and culture. Jeff’s work is a combination of his love for flowers and his passion for design, and he has come up with some spectacular concepts. If there is a look you love, don’t be intimidated by the size or the grandeur. Sometimes even a small element or the inspiration is enough to show you what your wedding or event flowers can be. Best of all, buying bulk flowers from a reliable online vendor such as BunchesDirect lets you create your own versions of these over-the-top creations. Here are some great tips you can use yourself! 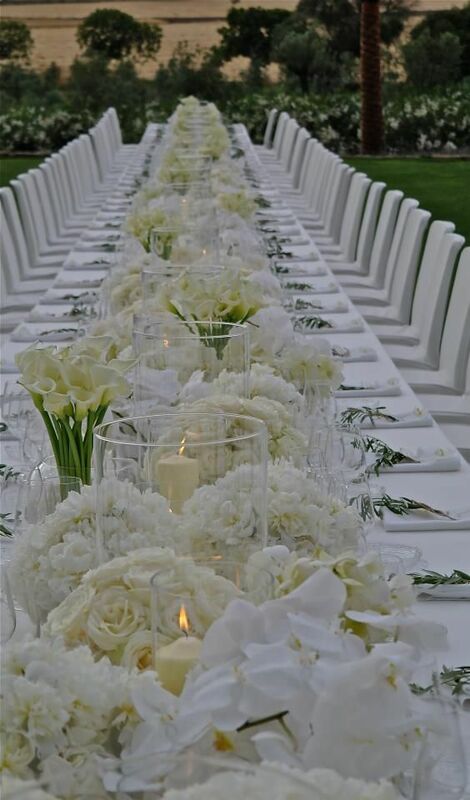 White on White Mass together white flowers with candles, and you will always end up with a spectacular look! Choose gorgeous flowers such as white calla lilies, white hydrangeas, white roses, stephanotis, or white orchids—all are available at BunchesDirect for bulk pricing. This “white on white” look is timeless and classic, and relatively easy to recreate. Mass together the blooms or keep things scaled back to suit your own budget. Creative Arrangements. Source out some creative vases, such as these fishbowl shaped ones with openings on a tilt, and place your blooms right inside. Using a rich color like this royal purple will add to the dramatic effect. Choose blooms such as lavender dendrobium orchids, purple carnations, purple lisianthus, or purple alstroemeria for amazing effect even on a low budget. 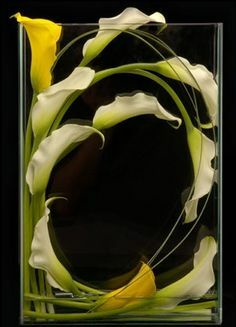 These artfully arranged white calla lilies are simple yet so effective in this tall, narrow rectangular vase. This is easy to reproduce for little cost at your own event! Vivid Color Combinations Give your wedding or event a shot of bold style by putting together beautiful flowers in unexpected colors and textures. If Jeff can do it, you can too! Use his designs to guide you in what “goes” with what. Choose eye-catching blooms such as hot pink roses, orange ranunculus, dark purple call lilies, hot pink carnations or purple cymbidium orchids, paired with green hydrangeas. Your guests are sure to remember these exciting and beautiful combination. Use your Space You can set flowers anywhere, and the more you can afford, the more luxurious the final result. We don’t all have this kind of budget, but don’t be afraid to set bouquets or bulk flowers along a staircase, or create unique hanging displays of bulk flowers in a smaller scale for your own venue. Vary The Height Jeff mixed these beautiful spring colors of pinks and greens, setting them off with candles in chunky glass candlesticks. 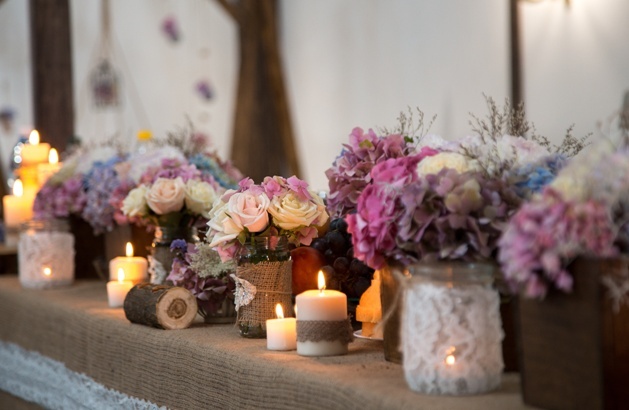 Create even more visual interest by varying the heights of your centerpieces and candles. Try pink carnations for a beautiful budget-saver, mixed with green hydrangeas. Beautiful Vases If you want to use fewer flowers to save on budget, you can still create a very artistic and memorable display if you choose beautiful vases in vivid colors or interesting shapes.You can always check in with family and friends, or scour vintage shops and estate or garage sales and come up with some lovely finds. This display makes the most of the beautiful crystal embellishments and deep emerald green, as well as the interesting rounded shapes, of these vases, using only a few bunches of white calla lilies and minimal white roses. 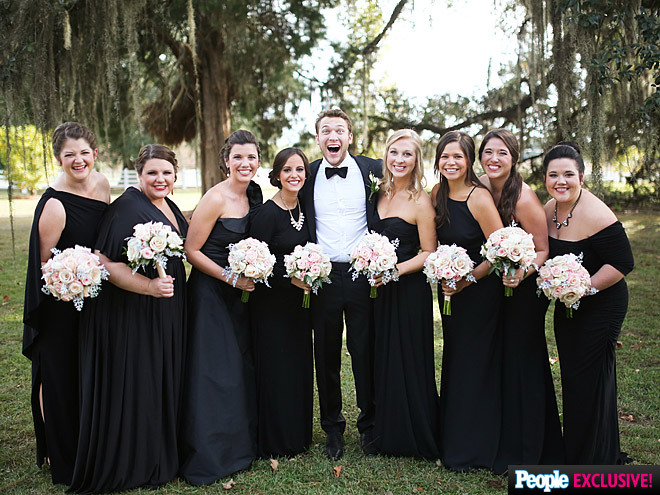 Phillip Phillips, 2012 American idol winner and top recording artist, married long-time girlfriend Hannah Blackwell on Saturday, October 24 in a beautiful outdoor ceremony. The pair wed at the Resora Plantation in Albany, Georgia, in front of 250 close friends and family. 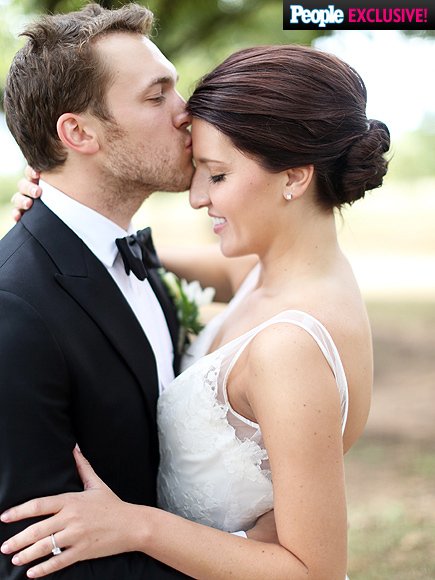 Hannah wore a beautiful Hayley Paige wedding gown, while Phillip rocked a Billy Reid tuxedo. 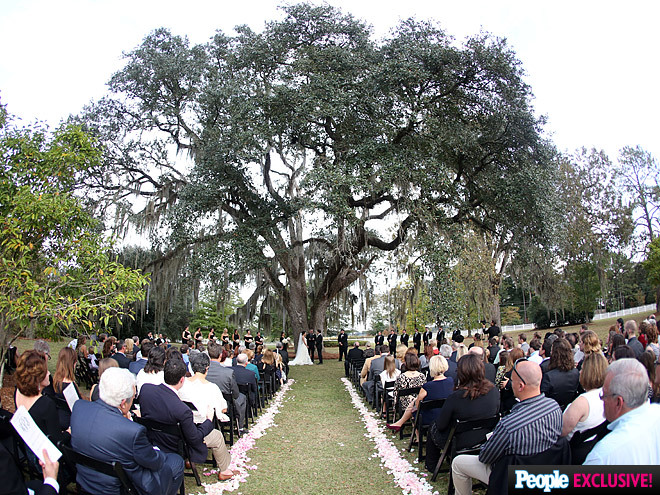 The pair exchanged vows under a huge oak tree on the Plantation, and then continued the celebration with a true Southern-style party. The couple first met almost seven years ago a charity event for Phillips’ sister’s organization Mission Change,. 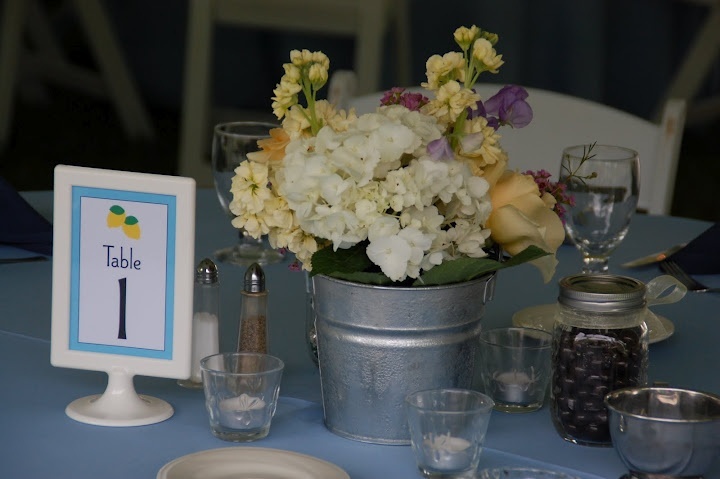 Their reception was catered by Merry Acres Catering, who helped create the Southern menu for the buffet stations the couple chose over a sit down dinner. The menu included bacon and tomato sandwiches, okra roll-ups, mini country ham biscuits, shrimp and grits and bacon-wrapped water chestnuts. There was also a mashed potato bar at the reception. 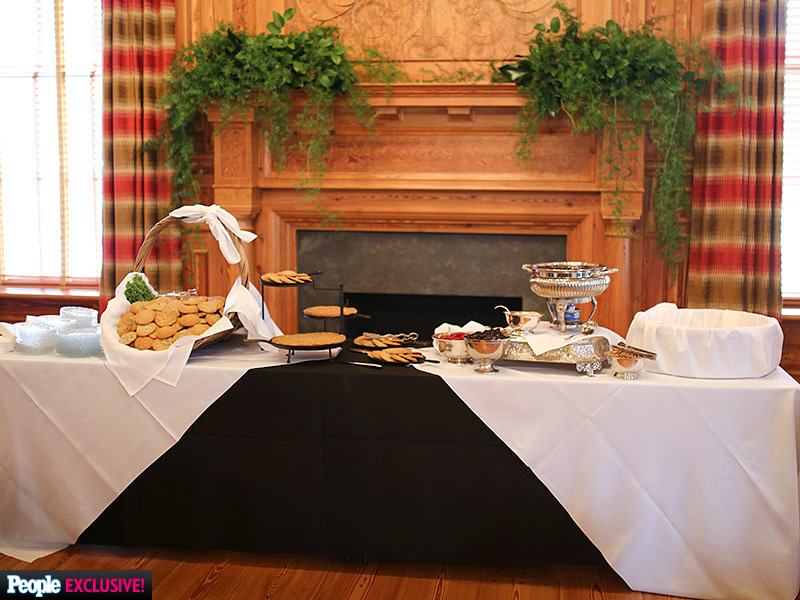 Instead of having a traditional groom’s cake, Phillips chose to serve miniature hot skillet chocolate chip cookies with ice cream. 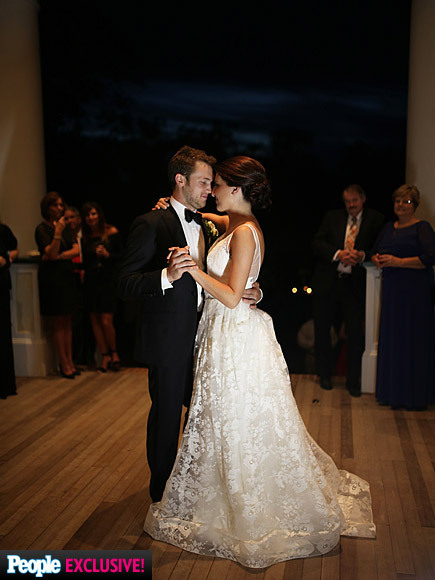 Romantic Phillip and a close friend wrote the song for his first dance with his wife. . “I might be crying while I’m dancing with you,” he told Hannah. If you love Hannah’s look, become your own “Southern Belle” with these BunchesDirect bridal bouquet suggestions: Pink Dreamland, Touch of Peach, Hint of Softness, or Hold me Close bridal bouquets. More at the website. We wish Phillip and Hannah all the best!